What is a prayer walk? Prayer-walking involves taking our prayers to the very places where we desire to see God’s presence manifested and our prayers answered. Prayer-walking is the powerful dynamic of praying on-site with God's sight. It uses the sights, sounds, and even smells, to engage both body and mind in the ministry of prayer. 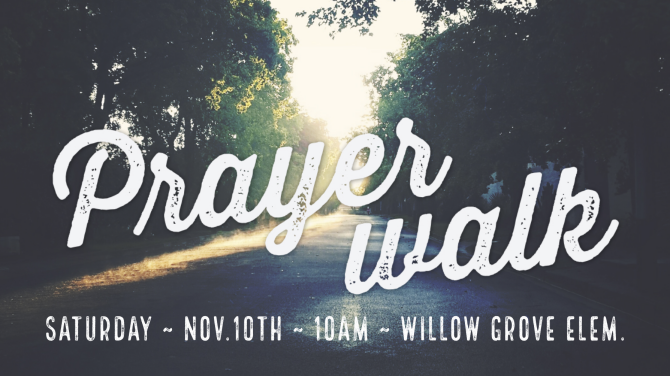 Join us at Willow Grove Elementary on Saturday, Nov. 10th at 10 a.m. as we pray on behalf of our community! We will be praying together for God to reach our community with His gospel, to open our eyes to the needs He has called us to meet, and to bless the ministry of Wave Church SD in the coming year! To sign up for the Prayer Walk, click here.